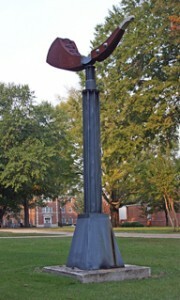 Dimensions: sculpture approximately 12 x 7 x 3 ft. Description: the piece represents the Texas Longhorn Cattle. 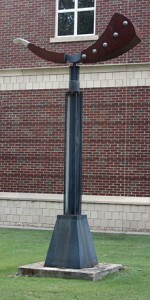 It has had one renovation during the Fall, 2004, and is scheduled for a fresh coat of primer and paint to refurbish the piece in the Spring, 2009. Location: Beside Harrin Hall, near McAlister and McCastlain Halls.